Picture via Creative Commons; Courtesy of THOC. This weeks law lecture was a real eye opener into the dangers of breeching copyright. Copyright began life in 1757, and literally outlined 'the right to copy' (rather than the right of ownership). Copyright is an intellectual right. It determines the extent of quotation or work a third party can use, and establishes the right of the creator, and makes sure they receive any financial profits. 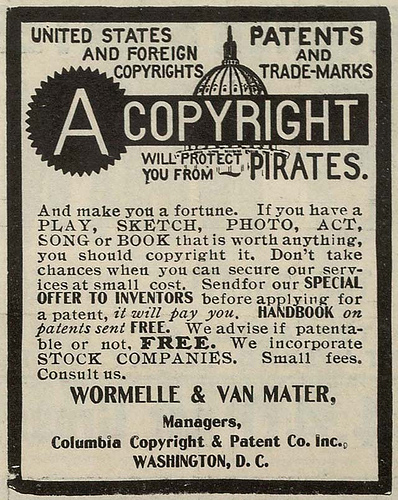 The ownership of the copyright lies with the originator of the work, or jointly if there is more than one originator (or to a business, for example a publisher). In simple terms, copyright means that anything original that any person creates, whether for publication or not, is automatically copyrighted as soon as it is created in any form. Original in copyright context does not mean that the work must be innovative, unusual or literate, but that it has not been copied by any other person, and that the author has worked (however minimally) to produce it. It is protected by law, both in Britain and is almost all other countries. Copyright is of extreme importance to the creator, and should never be parted with as it is very important in financial terms. Publishers usually respect the authors wish to retain copyright, however some publishers may demand them to surrender their rights; if the author protests, the sum offered as the purchase price of copyright ('outright' payment) may be decreased considerably. Any work created must be original before they can be protected by copyright. The definition of original is that the author have devoted skill and labour to its creation, this is called the 'sweat of the brow' tests. A slavish copy of an existing work will not be protected however, nor is the alphabet or number 1 to 100. However, the creation of a new typeface, font, letters and numbers will be protected. Both laws provide different types of protection for original works. Copyright protects expressions, rather than ideas, procedures, methods of operation or mathematical concepts. A patent is an exclusive right granted for an invention, which is a product or process that provides a new way of doing something or provides a new solution to a problem. Under the Universal Copyright Convention it is necessary to include on any published work a copyright line; this consists of the word "Copyright', followed by the copyright symbol, the name of the authors and/or the copyright owner and the date the work was first published on. However, if you do publish your work without a copyright notice, you have not lost your right to copyright, unless you have assigned it to another person or company. The Copyright, Designs and Patents Act of 1998 does not mention copyright notice as a requirement, and it is not a requirement in British law; however it is a requirement in the Universal Copyright Convention, so is worth adding to your work. It is also advised to attach a copyright notice to your work before it is even published. If you wish to transfer the property right (as a whole or part of) to your copyrighted work, the you must submit it in writing (a form of contract) and in return for money. Instead of transferring ownership however, assignments and licence's are used so third parties can use the material in a controlled way, with the author still owning the copyright. Copyright gives the creator of a work the right to exclusively deal the work in different ways. The owner can permit others to use their work under guidelines or specific purposes. Copyright begins when the product in question is published -something is published when more than one person has access to the material (as explained above). It is also advised not to send your work to any companies advertising copyright protection, as there is no further protection in existence. Instead, you should post a sealed copy of your work to yourself and to keep it unopened (this way your work has been date stamped by a third party). Or to place a copy in the bank and receive a dated receipt. The period of copyright lasts the length of 70 years after the creators death; a dvd or sound copyright lasts 50 years, unless the author has stated differently in their will (for example, if the rights are left to family or charity. Literally works: Novels, poems, plays, films, musical works. Artistic Works: Drawings, paintings, photographs, sculptures, architectural designs. Generally known facts are not copyrighted, however the way they are expressed may be. Works of people who have been dead for over 50 years are not covered by copyright. Ideas are also not copyrighted; what is a considerable concern for authors. Authors may 'dream up' a book idea for example, and pitch it to a publisher, who could then give the idea to one of their regular writers. Titles are not copyrighted either, and neither is your name. You cannot complain that another author of the same name, or using the same name as yourself, is producing work that could damage your reputation. The right to object derogatory treatments of your own work is referred to as 'the right of integrity'. It controls others changing an original work which amount to distortion, mutation, prejudicial honour or effect the reputation of the creator. Reviews/Criticisms: Any sort of copyright work may be copied without liability if the reproduction is made for the purpose of criticism or review. A sufficient acknowledgement to the creator of the work is needed in every case. Fair dealing/usage: When reference to the product is needed, such as within criticisms or reviews. It acknowledges the defence of freedom of speech by allowing the use of copyrighted material to in 'worthy purposes' Credit is needed; eg, courtesy of. You need to make sure you use the minimal amount of the product to express your point. Learning/expression: You generally cannot sue for copyright if your material is being used by students for educational learning or is being used for artistic or dramatic reasons. Artistic accidental inclusion, rather than featured; eg, background shots. Permission: Permission forms are advises to be given out to interviewee's; this written permission you should keep on record and gives you a strong defence for usage rights. Public interest: The 1988 Copyright Act states that there is nothing within the Act that affects 'any rule of law preventing or restricting the enforcement of copyright on the grounds of public interest or otherwise'. However, publication of copyright material may be justified in court if the material is needed to be bought to the attention of the police or is causing harm. Innocent Infringement: If the infringer can prove they honestly did not know they were breeching copyright, the creator is entitled to a share of any profits made from their material but not damages. Incidental Inclusion: There is no definition as to what would be defined as 'incidental'. This defence is aimed at allowing people to show works that might otherwise be copyrighted, for example, capturing background music whilst interviewing someone in the street. Required by Statute: Taking copies of material that is required by statute to be open to public inspection (including public records and company records) is not infringement. No Copyright: Public policy may prevent copyright existing in some works. This rule is very limited. For example: The novel 'three weeks' could not be copyrighted in 1916 as it had a immoral theme. News Reporting: With the exception of photographs, copyright work may be used if it's purpose is the reporting of current events. 'Sufficient acknowledgment' is needed to give the owner of the work proper identification. Note: There is no copyright over facts, information, results or news. Damages can be awarded to a creator if another persons name is put onto a work which they did not create themselves and implies that the work is there own. Publishing or selling another work also rises to damages. Publications that make up quotations are at risk of a claim of false attribution of authorship. One issue always bought up when we record images ourselves is the use of people in public. The BBC Editorial guide states: When filming openly in public and semi-public places, we do not normally obtain express consent from individuals who are incidentally caught on camera as part of the general scene, unless they are engaged in an activity where they have a legitimate expectation of privacy that is not outweighed by a public interest in showing them. However, if an individual or organisation asks us to stop filming or recording (whether live or recorded) because of a concern about privacy, we should normally do so, unless it is editorially justified to continue. The BBC Editorial Guidelines state: Advice must be sought from the Talent and Rights Negotiation Group (TRNG) in Rights and Business Affairs about the commissioning or clearance of copyright works for use in BBC programmes or the contracting of performers. TRNG will generally provide the contracting service and contact should be made with them in good time. There may be circumstances where a copyright work, in which rights have not been cleared, can nevertheless be included in a programme under fair dealing or other copyright exceptions.